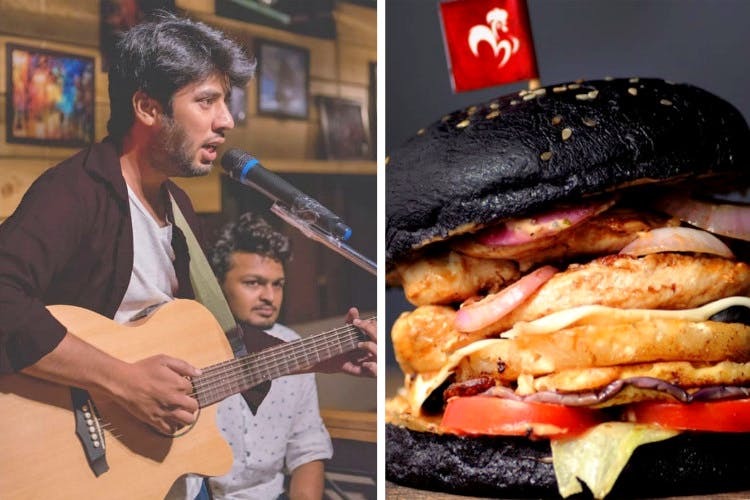 Barcelos, a bar located in Forum Sujana Mall is best known for its epic live music scene and drink deals that won’t leave you broke after a good day. Dishes from Africa, Portuguese, and Mexico find their place in Barcelos alongside American and European delicacies. Hit up the bar during its happy hours (4pm-8pm) for deals on IMFL and Sangria or ask for their Portuguese cocktails like Ola (a rum-based drink with rose and betel leaves) or M’atacas (rum, gin, and coke). The 500ml pitcher comes at around INR 945 which make for 3 glasses, and this is cheaper against INR 445 per glass. What complements your drinks are the Peri-Peri Grilled Chicken Wings that will leave you panting for water. The Portuguese or Mexican Rice Bowls cannot be missed while the handcrafted gourmet burgers come in three types — classic bun, red burger bun, black burger bun. The bar looks like a casual American diner, and for the most part, it is dark. The live music isn’t available on all days, so you might want to check before hitting the bar. The bar has really loud music that makes conversations difficult on days without live music. Plus, the vibe of the place is really slow when there's no live music.